ISSN: 1531-6505; Issue 45 - Subscribe Free! SPONSORED BY: Groove Monkee MIDI Drum Loops - Buy One, Get One Free! Groove Monkee provides premium MIDI drum tracks in a wide variety of convenient formats: GM, GM multi-track, BFD, GURU, DFHS, DFH C&V, DFH 1 & 2, Groove Agent, Reason 2, Session Drummer and MIDI Groove Clip. Groove Monkee has provided custom content to Cakewalk, FXpansion, Linplug, Groovebox Music, Music Tech Magazine and other organizations. And visit the Groove Monkee website. But hurry because this offer ends July 31st, 2013. Cakewalk users rejoice! The ultimate information resource for Cakewalk SONAR X2 (Producer, Studio, and Essential) is now available. To celebrate the book's release, this issue is dedicated to Cakewalk SONAR with a feature article, tip, and video. Plus, we've got industry news and discussions. Yes, the SONAR X2 Power! book is finally here. If you find yourself struggling with Cakewalk's latest incarnation of the SONAR music sequencing software or you want to learn some more advanced tips and techniques, you can now rest easy. SONAR X2 Power! will walk you through all of the new features and changes in SONAR X2. This time around Cakewalk has refined the workflow that was introduced in X1 and they've added a number of new features as well. SONAR X2 POWER! is an all-new edition. No matter what genre you're working in, or what part of the music/audio world you call home, you will benefit from the book's clear guidance and the wealth of production tips and shortcuts. New topics covered include: Take Lanes, Automation Lanes, Automation Modes, new Smart Tool operations in all the views, new clip functions in Track view, Piano Roll view editing and Controller lanes, new Snap to Grid features, R-MIX SONAR, FX Chains 2.0, new ProChannel features, ProChannel Console Emulator, ProChannel QuadCurve EQ, ProChannel Softube Knob, and much more. In addition, the SONAR X2a update and features added in the SONAR X1a, b, c, d, and Expanded updates are included in this new edition, so the book is completely up-to-date. You can find more information, a table of contents, a preview, and discount purchase links at: http://www.garrigus.com/powerbooks.asp. And for those of you who are continuing to use SONAR X1, my SONAR X1 Power! book is also still available. I want to give a special thanks to all those who pre-ordered SONAR X2 Power! and have already posted nice reviews about the book up on Amazon and the Cakewalk Store. Thanks to: Jim Kashner, Herbert G. Roselle, David W. Ranck, Philip Buglass, Swedish Knife Man, Mike Moses, Gtrpstr, Lance Martin, Greg, Charles Gould, Mike McCafferty, Scot Clayton (SMCStudios.net), Joel Keen, David Jarvis, Marcus Curtis, John from the Sonar forum, Rcreesmusic, Adam L. Benson, Clinton Hoerner, Mojo "Gazza", Lee Faulkner, Paul Morgan, and Sir William. If I missed anyone, let me know. Thanks very much! I appreciate your support. And now I need even more nice reviews... pretty please? If you have already purchased SONAR X2 Power! 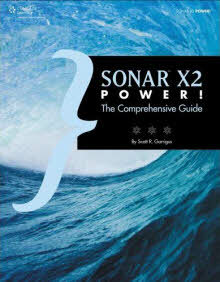 and would like to post a review on Amazon, please visit the Power Books site and click on the SONAR X2 Power! link. Then click one of the order purchase links to get to the Amazon book page. Once there, scroll down to Customer Reviews and click the Create Your Own Review button. Thanks! Thanks so much for reading DigiFreq! Now let's get this issue started... Enjoy! The European pop sensation known as Fiona (Miss 2.1) has released her latest single and accompanying music video, titled, "Up & Down," to rave critical and fan reviews. The song is a digitally composed, electronic dance music single that features the youthful verve and beautiful singing of Fiona (Miss 2.1). It is a romantic track with a carefree spirit and jubilant attitude, much like Fiona, herself. The single is the latest in a string of popular dance music singles from Fiona (Miss 2.1) that includes the powerhouse hits, "Lucky Night" and "Boy Toy." Written by Scott R. Garrigus - © 2013, Cengage Learning. Reprinted with Permission. 1. Select your reference track(s), which provide the timing on which the alignment will be based. In the case of drums, this will usually be the kick and snare tracks. 2. Choose Views > AudioSnap Palette (A) and click the Enable/Disable AudioSnap on Selected Clips button. 3. Adjust the Threshold and Resolution parameters in the Filter section of the Palette so that all the transients in the audio are accurately represented with markers. You may need to do some manual adjustment so that all the markers land right on the transients, but that’s usually not the case. 4. Right-click on the background of one of the reference tracks and choose Pool > Add Clip to Pool to add both tracks the AudioSnap Pool. 5. Choose Edit > Select > None (Ctrl+Shift+A) to remove the selections from the reference tracks. 6. Select all the tracks you want to align. 7. Right-click the background of one of the tracks and choose Split Clip(s) at AudioSnap Pool. This will divide all the clips in all the selected tracks at the transient markers that were placed in the Pool, creating new clips at every marker in every track. 8. With all the tracks still selected, click the Enable/Disable AudioSnap on Selected Clips button in the Audio-Snap Palette to disable AudioSnap. 9. Choose Process > Quantize (Q) to open the Quantize dialog box. I talked about how to use the Quantize function earlier in the chapter, although there are a couple of different things you need to do when quantizing split clips on multiple tracks. 10. Set the Resolution, Strength, Swing, Window, and Offset as previously explained (see the “Quantize” section earlier in this chapter). Then in the Change section, activate the Audio Clip Start Times option and deactivate all the other options. This will allow you to align all the start times of the clips in the tracks, and since each clip now represents a single drum hit, you are effectively aligning all the hits. 11. The only caveat of this method is that when you move the clips around, some of them will end up overlapping each other. This can cause noticeable pops and clicks in the audio. To prevent this from happening, activate the Auto XFade Audio Clips option. This option will automatically create crossfades between any overlapping clips, thus eliminating any of the possible problems. 12. Adjust the XFade and Max Gap parameters. These parameters determine the length of the crossfades and the maximum allowed gap between clips, respectively. I’ve found that setting the XFade parameter to 1ms and the Max Gap parameter to 80ms usually work best, but you may need to experiment with these settings. Your multiple tracks should now be quantized to the beat and nicely aligned without any kind of audio anomalies that can occur when stretching audio. DFreqDEALS - Groove Monkee MIDI Drum Loops - Buy One, Get One Free! Precisionsound releases Gothenburg Reed Organ Sample Library - Get 10% off! Acoustica 6 with Multitrack Editing and new Audio Restoration Tools - Get 10% off! Ohm Force Releases the Ohmicide Dubstep Session Pack - Get 10% off! Blue Cat Audio Releases Blue Cat's Liny EQ 5.0 - Get 10% off! Musicrow Releases Analogica for NI Reaktor - Get 10% off! macProVideo releases Advanced Kontakt 5 Video Tutorial - Get 20% off! Acon Digital Restoration Suite Released - First Aid Kit for Noisy Recordings - Get 10% off! 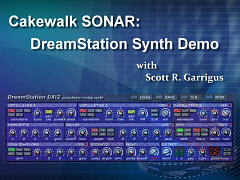 Scott Garrigus demonstrates how to use the DreamStation software synthesizer that comes included with Cakewalk SONAR. Topics include working with presets, building a basic DreamStation project, and creating your own DreamStation sounds. In addition, a secret sound creation feature hidden in the DreamStation interface is revealed. DFreqFINISH - Sign Up for the DigiFreq Forums! Copyright 2013 by Scott R. Garrigus. All Rights Reserved.